Ron Tressel, Gladstone girls frosh soph coach, commented that he was happy to make the extra effort for the day as he knew it would be a great community giving project for youth. Tressel said the enthusiasm from everyone was outstanding. 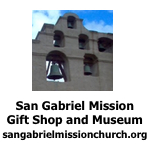 Local businesses helped by donating items for the project. 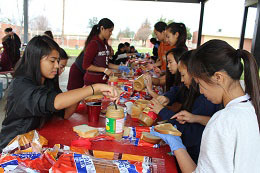 Oroweat on Temple City Boulevard in Rosemead donated 110 loaves of bread, Target in Rosemead donated peanut butter and jelly, Dollar Tree donated the zip lock sandwich bags. Taco Bell donated plastic knives for speading the peanut butter and jelly. The players also enjoyed a lunch of pizza and snacks that included the players and coaches contributing food to enjoy, said Tressel. “It is hoped that other teams and schools will take this idea and use it at their school,” said Lyons. 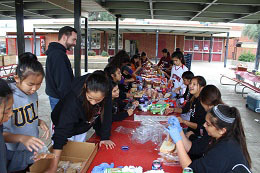 “Would be nice if the hundreds of high schools in Southern California did something like this on the third Saturday in January.” He said an interesting part was people watching Rosemead team loading many supplies into the bus to take with the team, and host Gladstone also contributed. The 1,140 sandwiches were delivered to Veterans of Foreign Wars (VFW) to distribute to people in need. Go Rosemead Panthers and Gladstone Gladiators!